ARP Nachi — Japanese Tier VII cruiser. A heavy cruiser of the "Fleet of Fog". Modeled after the Imperial Japanese Navy's 2nd Myoko-class cruiser, Nachi. Harnessing an exceptional reconnaissance ability, she can track I-401 even during her silent runs. In combat, she acts as a spotter; calculating data for Myoko’s long-range engagements. Her Mental Model "Nachi" acts as "Treasurer" under Hiei’s "Student Council of the Fog". Having a rather placid personality, she is often swayed by her energetic colleague, Ashigara. 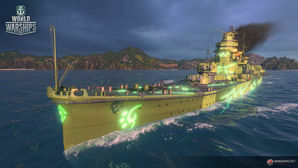 This warship has been specially designed for World of Warships, and is modeled after Nachi as she appears in "ARPEGGIO OF BLUE STEEL -ARS NOVA- Cadenza". Nachi is a powerful being in "Arpeggio of Blue Steel" manga and its Ars Nova anime adaptation, with enormous speed, numerous matter annihilating weapons, incredible information gathering capabilities, and a protective field that is impenetrable to any weapon developed by humankind. However, so the game does not turn into "World of ARP Ships" with a few insignificant human targets cowering in the background, the developers have declined to provide her with her true complement of abilities and weaponry. ARP Nachi' performs exactly like the standard Myoko in the game (but without the ability to equip camouflage), and that means that she shares the same play style as regular Myoko. You can refer to the article on Myoko for her performance appraisal. Her armor is quite weak, and her large citadel makes her vulnerable to AP shells. A well landed battleship salvo can potentially remove the majority of her health, and while just carelessly charging into the heat of battle is not recommended for any cruiser, Nachi should be especially careful because of her squishiness (and because she lacks the aforementioned impenetrable protective barrier). But she also has the powerful 203mm guns that are standard for the Japanese heavy cruisers with low shell arcs, reasonable AP and powerful HE with high fire chance, giving her a powerful offense that can devastate cruisers and burn down battleships. She receives the formidable 61cm torpedo with long range and potent warheads (but which are unfortunately neither homing, supercavitating, nor equipped with corrosive warheads) in two triple mounts on each side, though their rearward arc can limit their offensive effectiveness. Her high speed and low detection range can be exploited to disengage when the fighting becomes hotter than you would like. While she has a reasonable AA complement and can function as an effective AA support ship when fitted with the right Equipment and Skills, she is better utilized as an offensive vessel, operating with the fleet or in cruiser squadrons to destroy cruisers and destroyers and harass battleships. ARP Nachi will serve well, and under the command of a decent captain can be a powerful influence on the battlefield. Does not come with overwhelming firepower, speed, submergence, Klein field, or advanced sonar abilities of Nachi in Ars Nova. As a premium ship, ARP Nachi doesn't have any upgrades to research. As this is an ARP ship, the ARP Nachi cannot mount camouflage. Render of Nachi’s mental model as she appeared in the Ars Nova Cadenza movie, and captain in the game. Nachi alongside Ashigara as she appears in Ars Nova, her mental model being barely visible atop her bridge. Nachi as she appears in the game, launching torpedoes from her starboard side. Nachi is one of Hiei’s subordinates and Myōkō’s younger sister. She is Ashigara’s partner and serves as the sonar operator, detecting enemy vessels utilizing her sonar scanner. Nachi was the second Myoko class heavy cruiser laid down by the Japanese Navy. Although incomplete, she was commissioned on 26 November 1928 and taken to Yokosuka to be examined by Emperor Hirohito as part of the Coronary Naval Review. Nachi returned to Kure in December where she was completed and made ready for service by April 1929. Once completed, Nachi and her three sister ships were assigned to the Sasebo Naval District and spent the early 1930’s conducting training and transport operations. From 1933 to 1937, Nachi underwent two modernizations and received numerous upgrades to her torpedo and secondary armament as well as additional anti-aircraft weapons. In December 1941, Nachi and Myoko, now assigned to the 3rd Fleet, departed from Palau to conduct shore bombardment for the planned invasion of the southern Philippine Islands. Nachi and Myoko were later sent to support the invasion of Davao and Jolo islands. While anchored at Davao, Myoko was hit by a single bomb from land based aircraft and Nachi was subsequently appointed as flagship while Myoko returned to Japan for repairs. In January of the following year, Nachi and her sister ships were sent to support the invasion of the Dutch East Indies. The heavy cruisers provided cover for the troops landing in the Celebes Islands and on Ambon before being tasked to eliminate the remaining Allied ships in the vicinity. On 27 February, Nachi and Haguro engaged the Dutch light cruisers De Ruyter and Java. The Japanese cruisers scored several torpedo hits on De Ruyter and Java and within hours, the light cruisers were abandoned and sank. Two days later, Nachi and her sister ships later engaged the heavy cruiser HMS Exeter. The English cruiser attempted to flee but was torpedoed by the destroyer Inazuma and quickly capsized. Following the success at Java Sea, Nachi returned to Sasebo, Japan, where she would undergo another refit in preparation for upcoming operations in the Aleutian Islands. On 26 May 1942, Nachi departed Japan and led the 5th Fleet in support of the assault on the Aleutian Islands. The ship escorted convoys to and from the Aleutians through early 1943. On 26 March 1943, Nachi, and the cruisers Maya, Abukuma, and Tama, engaged the American cruisers USS Salt Lake City and USS Richmond. The two fleets exchanged fire for nearly four hours before the Japanese fleet disengaged and retreated. Nachi sustained several hits in the battle which caused minor damage and returned to Yokosuka for repairs. Nachi again returned to the Aleutians in July to aid in the evacuation of Japanese forces. Nachi remained in Japanese waters for the remainder of 1943 and the first half of 1944. During this time, she again had her anti-aircraft armament increased. In October 1944, Nachi set sail for the Philippines and accompanied the battleships Fuso and Yamashiro at the Battle of Surigao Strait. After the battle, the ship collided with the heavy cruiser Mogami and was taken to Manila for emergency repairs. On 29 October, while still under repair, Nachi was attacked by American carrier based aircraft. A single bomb hit the ship during the attack which further set back her return to service. On 5 November, Nachi again came under attack from American strike aircraft. The ship sustained multiple bomb and torpedo hits which destroyed her bow and stern. Within hours, the ship sank in the waters off Corregidor Island. Nachi photographed soon after her full-power trials in November 1928. Nachi under attack by USN aircraft, 5 November 1944. Nachi sinking, 5 November 1944. Note her blown-off stern and bow.